Ibiza is the ultimate vacation spot for people who want to celebrate life and love. It’s a popular tourist destination because of it’s sheer natural beauty, hip establishments and raving parties. Romantic, lively and boho-cool, Ibiza is where you enjoy beach bliss and sunset chilling with your loved one, family and friends. Yes, Ibiza is not just about beautiful beaches. It is also known for its sunsets and perfect spots to watch the sundown, soaking the sky with wonderful colours. Let’s get to know more about the island and why it should top your vacation destination list. 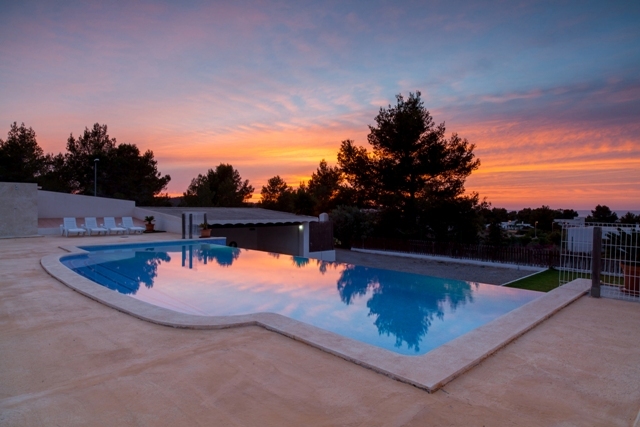 Seven million tourists visit the White Isle annually and stay in budget accommodations, like fancy holidays villas. Ibiza is an island in the Mediterranean Sea off the east coast of Spain, just 150 kilometres away from the city of Valencia. The White Isle is quite known for its beautiful beaches and tourists from all over the world spend summer here to relax with their families or party with their friends. Spend a couple of days to a couple of weeks exploring the beautiful surroundings in Ibiza and you’ll marvel at its natural beauty and man-made establishments. If you’re next question is, ‘where to stay in Ibiza?‘ There are plenty of accommodations to choose from. You can stay in 5-star hotels, boutique hotels and lodges. 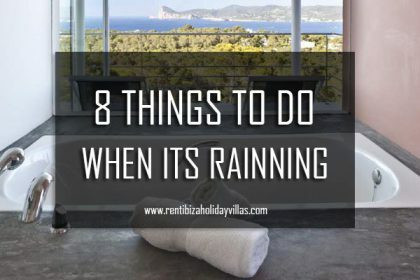 For a more authentic Spanish experience and if you are travelling in a group, we recommend that you rent an Ibiza Holiday Villa. It is perfect for families and friends who want to relax in the Balaeric Island. Have the most memorable vacation at an Ibiza beach party sunset, that could easily be one of the best experiences in anyone’s lifetime. Check out the White Isle’s beautiful beaches and coves, heritage and peaceful culture. But before you start dancing the night away, you can soak in the wonderful colours of island’s popular sunsets which is a burst of colours in the early evening sky. 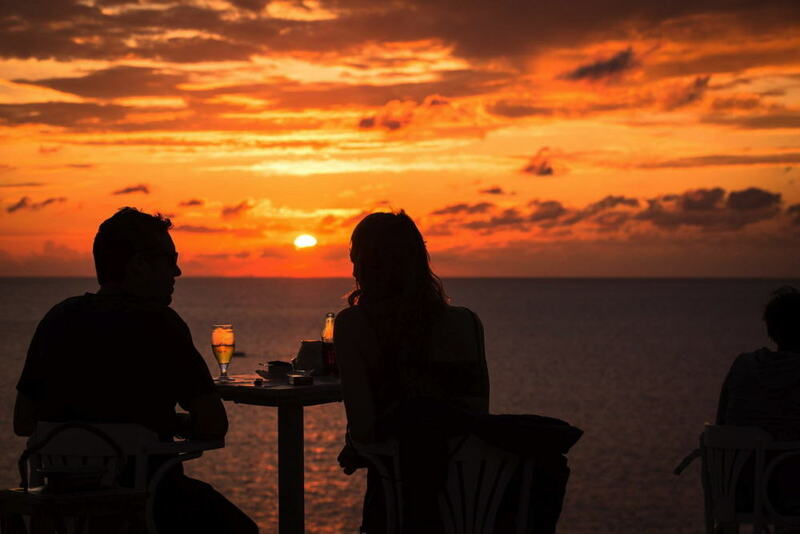 It is a romantic way to kick off a night of partying until the equally magnificent sunrise. Spend idyllic afternoons waiting for sundown on land or on water, aboard luxury charters and ferries. Marvel at the streaks of fiery red, orange and bursts of gold in the sky as the sun takes it bow. This is a paradise where many #relationshipgoals are realized. In it’s many sunset spots and islets, you can take as many Instagram worthy pictures of sky and its sleepy sun. 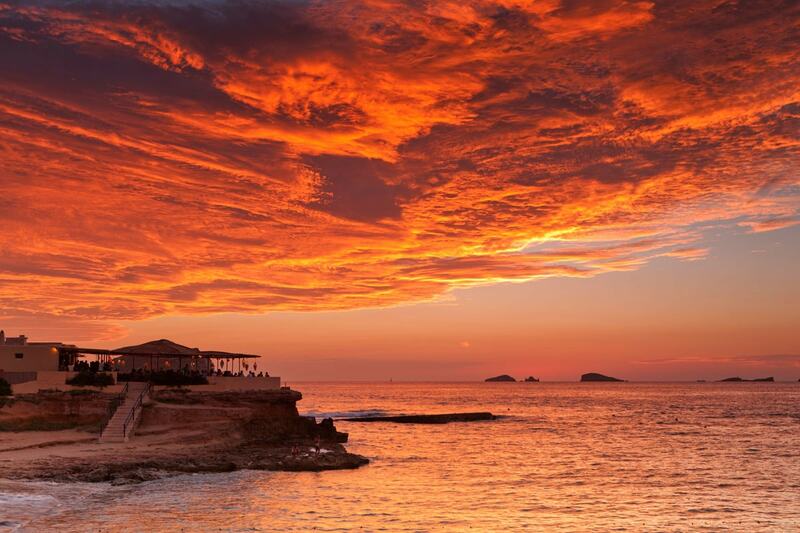 Or just bask in the beauty that is mother nature, in it’s finest, in Ibiza. So where do you catch a legendary sunset that could easily be the best you’ve ever seen? 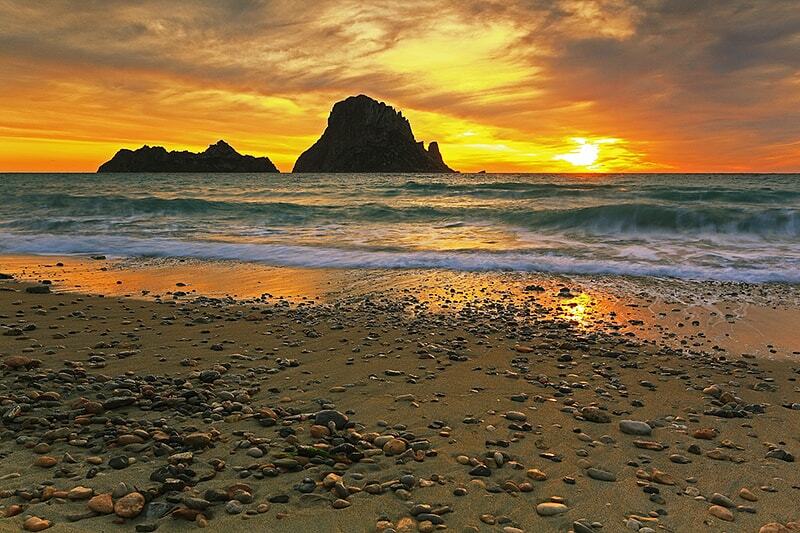 If you are looking for something that is authentic ‘Ibiza’, the Benirras Beach is definitely it. With partly pebbly sands and a one-of-a-kind rock formation known as Cap Bernat or ‘the finger of God,’ Benirras Beach is where you’ll have fun at the sea when the sun is up and even more as it goes down. The beach is also a popular anchoring spot for private yachts and motor boats, on which you can enjoy a romantic sunset. Local hippies and party-going tourists come together in this beach, especially on Sundays, to watch the drum-down sunsets that’s almost like a ritual. How to get to Cala Benirras? Benirras Beach is only a 10-minute drive from San Miguel where you only need to follow the signposts. The roads are closed from June to September when the parking is full. You will need to board a bus in San Antonio or Ibiza Town to get to the beach. You can visit the IbizaBus.com for the bus’ schedule and routes. Otherwise known as the Platges de Comte, Cala Conta is where three beaches meet. The naturally beautiful area is where you will get to enjoy the sun with the company of your family and friends, then watch the day dissolve. Be it on the sand or on one of the many beach bars in Cala Conta like the Sunset Ashram, you will surely marvel at the rich scarlet colours in the sky as the sun sets, while holding your partner’s hand. At Cala Conta, you’ll find beach bars, restaurants, beach boutiques, loungers, parasols and a lot of things to do aside from watching the sun set. You can swim, soak in the sun, ride pedalos or hang out at the establishments by the beach. How to get to Cala Conta? Cala Conta is just a 15-minute drive from San Antonio, Parking can be a problem during the peak season, but you can always ride a bus or ferry to get to the best beach in the White Isle. 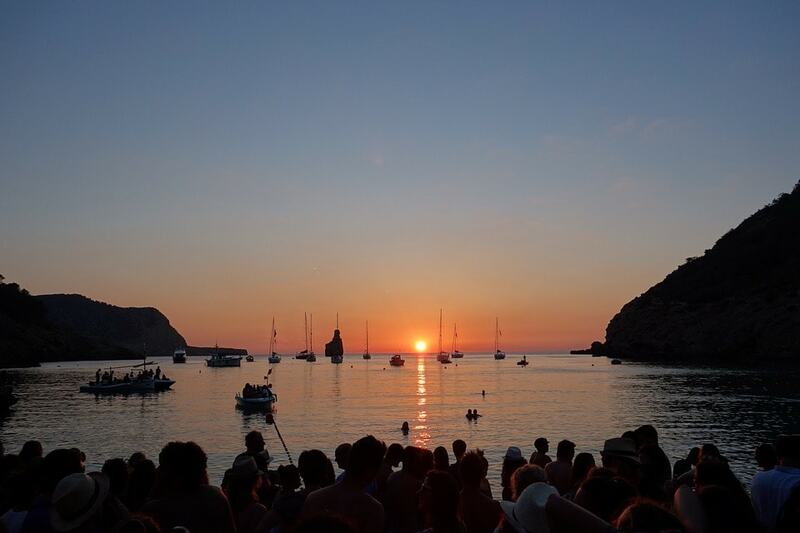 The Sunset Strip in San Antonio, Ibiza is one of the most popular places in the White Isle to watch the sun set. Board a sunset charter to watch the sun call it a day while sipping champagne and lounging around. There are large public areas dedicated to watching the sunset which makes Sunset Strip the most iconic areas in Ibiza. With restaurants and bars open all day, enjoy drinks and gourmet dining before the crowds gather in the early evening. DJ’s from all over the world come to the Sunset Strip Ibiza for parties and raves in the seafront area. How to get to Sunset Strip? To get there, you only need to walk for 10-12 minutes from the San Antonio urban centre. For Instagram worthy pictures, there is no better place to be than the Cala D’Hort. With breathtaking views of the sunset, watching the might sun setting down with majestic colour bursts over the islets of Es Vedranell and Es Vedra – you will be thankful you are in the White Isles. Cala d’Hort is a beach with a great view of the Es Vedras islet. It has amenities for tourists who want to spend a day of relaxation until the sun sinks in the ocean. Spend a summer day, relaxing under the sun on loungers and parasols. There are dining options in the beach itself as well as public restrooms and lifeguards to make everything more convenient for you and your family. Cala D’Hort is just a 10-minute drive from either San José or Cala Vadella. You can just follow the signposts to reach the beach or use your mobile device’s map application. What you’ll love about the Cala D’Hort is that it will give you access to the Torre d’es Savinar. This sunset spot is actually a large defence tower that will allow you an even better view of the beautiful Es Vedras. How to get to Cala d’Hort? Drive to Cala d’Hort and keep an eye on the signposts on the dirt road. You might miss it because it is difficult to spot, so ask tourists and locals you see on the way. Once you find the entrance, leave your car in the parking area and climb to the top of the tower for an unparalleled view of the best sunset in Ibiza. 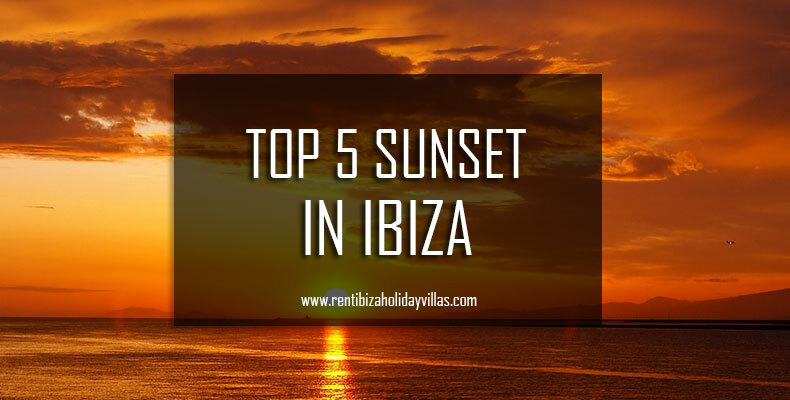 If you are up for dramatic sunsets, board an evening boat from Ibiza Town to Formentera. Here you can follow the sun as it sets in various colours from fiery red to dusty pink. See the sundown within the 30-minute ferry crossing. 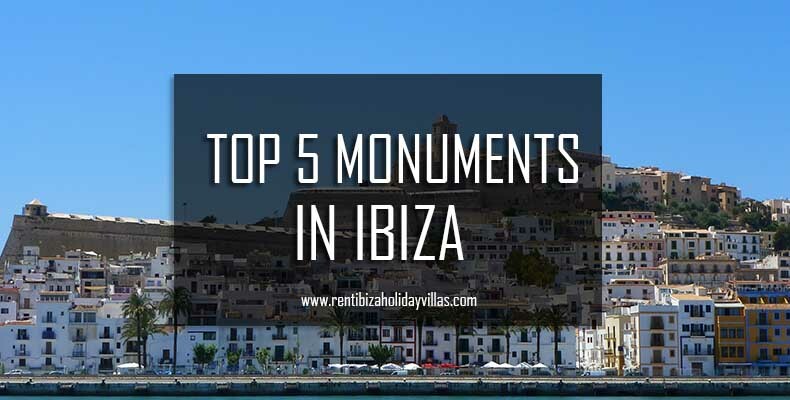 But don’t forget to explore the capital of Ibiza first. Should be a definite, at least, day trip for any visitor to the White Isle. This old town has boats and transport links all over that makes travel so much easier by land or by water. 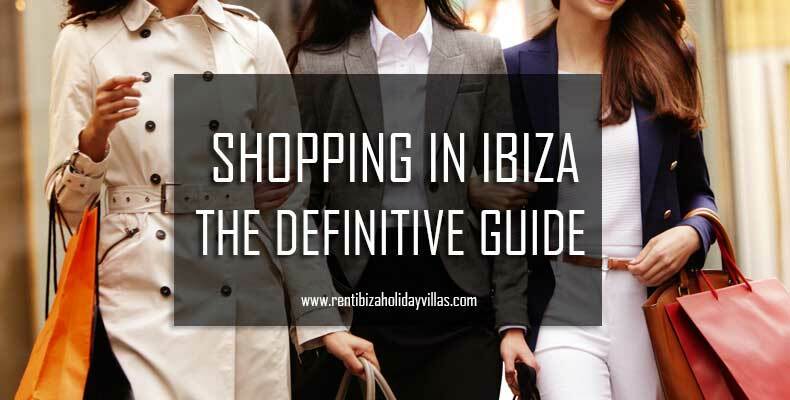 Get lost exploring Elvissa or the Ibiza Town where you can shop, sightsee and eat. You can also tour the different beaches in Elvissa, like the Cala Talamanca, which is 20 minutes away on foot from the Dalt Villa. As for nightlife, you can check out the Playa d’en Bossa that is home to many upscale clubs in the White Isle. For a more quiet exploration, you can visit the many art museums and galleries in the town. 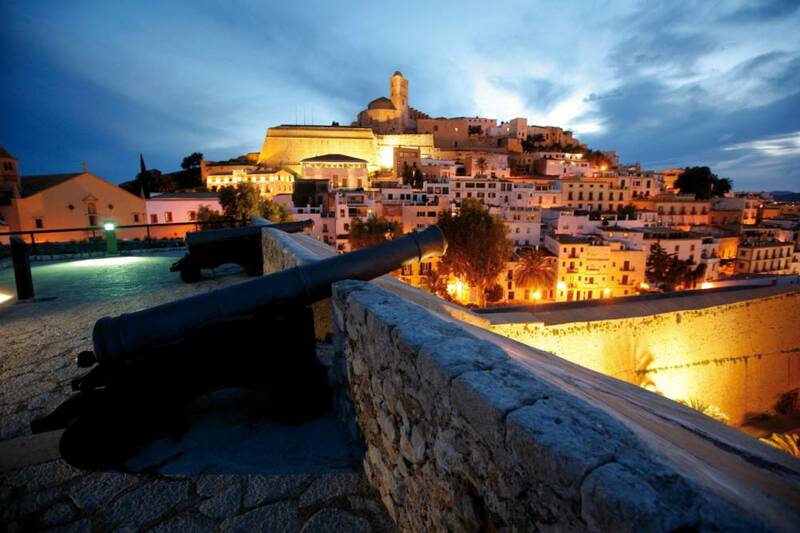 You will see them lined up in the mostly in the narrow cobbled streets of the Dalt Vila. Be sure to set foot on the Cathedral that has spectacular views of the entire coastline where you’ll find the Las Salinas. As a runner up for the best places to view the sundown, the Las Salinas is within a nature reserve. Enjoy the salty air and clear glass-like waters reflecting the sun’s majestic rays. How to get to Ibiza Town? head straight for the bus stop outside the airport as soon as you get off the plane. Not enough? Dont worry here are some other beaches that you might find useful for your holidays and sunset experience in Ibiza: Cala Tarida, best beaches in San Antonio Ibiza. Also, 15 Bests beach clubs in Ibiza. And one more recommendation if you do not have a place to stay yet, you will enjoy and enjoy an amazing sunset from this villa: Villa Esgueva.